Polish a small section (12" x 12") until the polish starts to turn clear. Wipe off residue and inspect your results. Salt spray, rain and other airborne contaminants attack your boat�s eisenlgass windows every time you take it out on the water. Over time these pollutants cause your eisenglass windows to yellow and discolor, and in severe cases they will even crack! 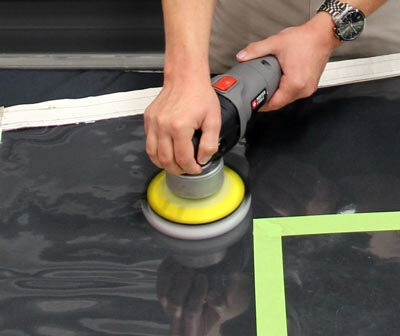 Rest assured a solution is available: Marine 31 Clear Vinyl Restorer & Protectant � an all-in-one cleaner, polish and protectant for eisenglass windows. If you haven�t been regularly cleaning your boat�s eisenglass windows using Marine 31 Plastic Clear from the day they were new, chances are they are a bit dull and the clarity needs to be restored with Marine 31 Clear Vinyl Restorer & Protectant. Two completely different products that, when used in conjunction, will keep your boat�s eisenglass windows crystal clear for as long as you own your boat. Using the wrong polishes and cleaners on eisenglass and clear vinyl surfaces will cause premature yellowing and fading. 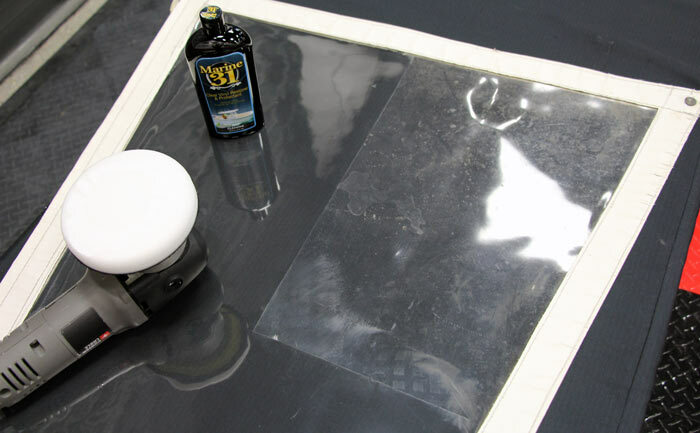 Protecting your boat�s eisenglass windows doesn�t need to be a daunting task � restore clarity and add a durable coat of protection in one step with Marine 31 Clear Vinyl Restorer & Protectant. Then, use Marine 31 Plastic Clear to maintain the finish. Don�t stop at your boat! Marine 31 Clear Vinyl Restorer & Protectant works equally well on clear vinyl automotive surfaces, like Jeep windows and plastic convertible top windows. It will restore clarity while depositing a durable UV coating. Marine 31 Clear Vinyl Restorer & Protectant can be applied by hand or machine, even in direct sunlight! Use with a dual action polisher equipped with a foam polishing pad for best results, or to remove stubborn scratches. From our testing, the Porter Cable 7424xp equipped with a WHITE Lake Country polishing foam pad works best. Check out the before and after difference! The top right corner of this eisenglass window was the only portion that was NOT polished. We put a tape line down to show the dramatic before and after.